Cardio workouts get your heart rate up, your blood pumping and burn a lot of calories, which is why they're so good for losing weight and avoiding heart issues. 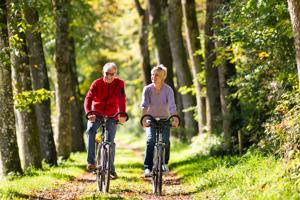 Some great aerobic exercises seniors can easily do are jogging (or even just walking) outside or on a treadmill, biking or swimming. The American Heart Association recommends getting 30 minutes of moderate aerobic exercise at least five days per week and more if you need to lower your blood pressure or cholesterol levels. Strength exercises also get the body moving and burning calories, and they have added benefits like improving balance and muscle control. Use weights or resistance bands to get the most out of your strength training exercises. The American Heart Association recommends doing strength exercises twice a week for better heart health.